Because you’re already a beauty, your philosophy is: less is more. We know not all ladies think alike, and some hate the way makeup feels, looks or smells, so we have specialized a guide for the days when you DO want to wear makeup and look effortlessly polished. We know you hate the harsh lines of black liquid liner, so opt for a brown pencil or brown matte eyeshadow. With a dark brown, you can line your top and bottom lashes. Top it off with a volumizing mascara for extra definition and an opening effect. 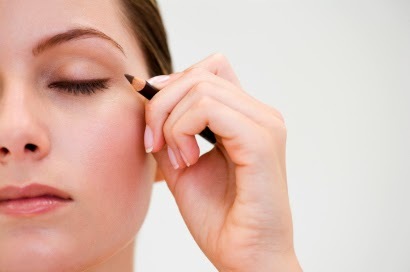 If you find that your eyebrows get lost in your face after defining your eyes, swipe one coat of mascara on them. Trust us, it works; it is the best lazy girl tip. We know this is a no-brainer, but it never hurts to say it again: don’t slap on blue eyeshadow or anything bright on the first go. You will end up loathing your makeup routine and underestimating the power of makeup. Before applying makeup, it is essential that you cleanse and moisturize your face. After washing your visage, wait two to five minutes for the moisturizer to absorb. Finally, do not make the biggest beauty sin by neglecting to remove your makeup at night. This is when it is not okay to be lazy. With great power, especially makeup power, comes great responsibility. Take it off because you don’t want a zit war to erupt overnight. Our biggest beauty pet peeve is a cake face, which is one of the biggest reasons you hate wearing makeup. If you loathe foundation and find no need for coverage, don’t put on foundation. Just forget it; you don’t need it. If you do want coverage, try a BB Cream or a tinted moisturizer, which are the most natural. To avoid cake face, only powder your T-zone. Finding the perfect base is a trial and error process. Don’t give up. Just like foundation is optional, so is concealer. Instead of covering your face with a tinted moisturizer, a concealer is a better solution for hiding a few pimples and dark circles. Foundation and concealer can be interchangeable -- you pick. Blush is one of the most personal beauty items in any girl’s makeup. Your favorite blush says a lot about your personality and what complements your complexion. We recommend you try cream blushes; they don’t require much work or a brush! Use the most simple makeup tool, your fingers, to apply. Pinks and peaches work for everyone, again, no bright colors. As beauty aficionados, we hate to confess, some of us just don’t like lip gloss. It can feel uncomfortable, and it can be too shiny, and our hair can get stuck in it. Stick to lipsticks; if that’s also too much for you, lip butters and colored lip balms also are heavenly sent. The best benefit about luxury beauty stores like Sephora and Nordstrom is that you can return a product after testing it. After all, you are the girl who concentrates on staples, so keep to the basics, and go for the best. This way you won’t be spending money you don’t have, and you never know, you may end up falling in love with makeup. Study your face, and test out the items you’re interested in buying. And don’t be afraid to ask the employees for recommendations as they have had training to help them find the best product for each client. If you are curious about a certain product your BFF raves about it, Google it -- do your makeup research. You’d be surprise how the logistics of makeup help you to create the perfect look. Look up product reviews and makeup tutorials anytime! Check out MakeupAlley and YouTube. Don’t feel pressured by society’s norms to wear makeup. As an educated woman, you know women are created equal, and you have the right to exercise your tastes and demands in what constitutes as beauty. Don’t let your boyfriend, girlfriend, family or friends sway you into believing any different. Do what you like, simple as that! Wear makeup for yourself. So your boyfriend doesn’t like your new red lipstick? Too bad, you’re wearing it for you, because it makes YOU feel good! We promise these tips won’t have you looking cakey or unrecognizable. Practice makes perfect. Its all about the natural look ladies. Lets not look like a clown! great article!